After several months of hard work at Distributed Proofreaders, another book from our digital collection has been released in a new electronic edition. 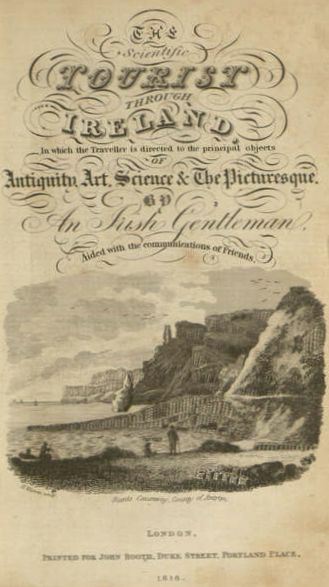 The Scientific Tourist through Ireland, published in 1818, is a guidebook for readers planning to visit Ireland. After a general introduction to some of the types of sights to be seen, the bulk of the volume consists of a county-by-county breakdown of noteworthy sites. The “Scientific” aspect alluded to by the title is the fact that, in addition to historical and cultural destinations, the book also notes the locations of interesting plants and minerals across the island. The E. window is considered as a specimen of very curious workmanship; and the tourist must not fail to notice a line drawn across the middle of the eastern gable, with a figure on the N. side, about 12 feet from the ground, said to represent an evil spirit who was very troublesome to St. Cullin, the founder, during the period of its erection, this black gentleman acting the part of Penelope towards her suitors, and pulling down in the night what the Saint and his holy comrades had set up during the day. To check the troublesome intruder, the Saint blessed some ropes and drew them one night along the top of the building, when the Spirit, like a fly in a spider’s nest, got entangled in the ropes, and being unable to extricate himself, was caught by the monks in the morning, who gave him some sound correction for his offence, but set him loose again upon the public, as is too often done by our modern police, and pretty much, perhaps, for similar purposes. For those wishing to learn more about what the early 19th century traveler could discover in Ireland, the entire text may be read or downloaded through Project Gutenberg.